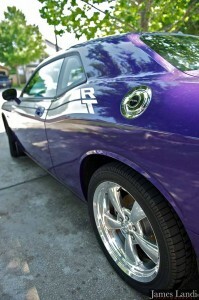 In 2010, Dodge released two 40th anniversary colors. Plum Crazy Pearl (paint code FHG) and Furious Fuchsia Pearl (paint code PHP). Both where only offered on R/T Classics and SRTs. Both 40th edition cars where suppose to be numbered from the factory, however only the Furious Fuchsia had numbered dash plaques as well as an option for white interiors. The following pages document the upgrades I’ve performed to the car so far.